At long last, Spring is on the way. 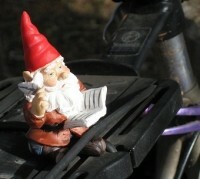 Holed up in his cosy nook, the MicroGnome reckoned it was about time to go heading for the hills. So he stuffed a few essentials into his knapsack, filled his hip flask and hitched a ride on an off-road biking trip into the hills. His biking companions chose to pick up the first few kilometers of the Munda Biddi Trail; a cycle track that follows a path roughly to the west of the Bibbulman Track. 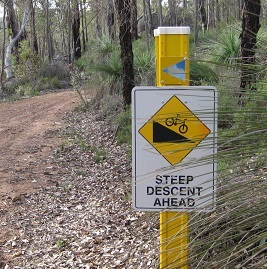 The northern terminus of the Munda Biddi Trail is near Mundaring, from where it twists and turns through heavily wooded slopes near the Mundaring Wier. Needing to stop at the Mundaring Hotel to find his bearings, the MicroGnome was obliged to fortify himself, secure his safety belt and prepare for a series of steep descents. His caution was well timed. Despite a few close calls, there wasn’t a single incident involving a far-flung gnome. Some of the climbs were a bit the worse for wear and tear, and in places the track has been reduced to rock-lined ruts by recent rain. The most unexpected obstacle to the MicroGnome’s off-road progress was a water crossing near the head of Helena Brook. There was no getting away from the fact that the gnome’s feet were going to get wet. Pedalling with wet feet is a strange sensation, particularly when the rest of you is perfectly dry. In spite of recent rain, some of the going was excellent, including via fire breaks and alongside water pipelines. But in other places the route mysteriously disappears without trace of a marker or direction-setting sign. The gnome hopes that the longer stretches of trail past the Darling Scarp are more clearly indicated to avoid huge unintended detours. The Munda Biddi Trail is expected to join up at Walpole next year, forming a continuous cycle trail between Perth and Albany. That’s likely to mean far more people heading for the hills to bike off-road.